Ableton and Cycling '74 have announced the release of Max for Live. The product integrates the Max/MSP audio visual programming language with Ableton's Live 8 digital-audio workstation. Co-developed by Ableton and Cycling '74, Max for Live opens up the Live platform, allowing users to create and edit their own devices. Max for Live creations are integrated into Live's interface and workflow, just like native Ableton instruments and effects. Users can create unique synths and effects, algorithmic composition tools, or hybrid hardware and software music machines. Users who don't want to build their own devices can access Max for Live's collection of instruments and effects, which are pre-made and ready to use alongside Live's native devices, the company says. Such users will also be able to take advantage of new devices created by other Max for Live users. A Step Sequencer that lets users play up to four concurrent sequences, each with up to 16 steps. The Buffer Shuffler audio effect, which "shuffles" incoming audio by buffering, then replaying it in a specified order. The Loop Shifter, a creative loop playback device that uses MIDI notes as triggers for playback states, with each MIDI note representing one state. Pluggo for Live, which features more than 40 devices from the Pluggo collection, including audio effects and instruments, all re-built and optimized for use within Live. Various tools, building blocks, and tutorials, featuring numerous new MIDI and audio effects, ranging from common studio utilities like graphic EQs to creative MIDI utilities such as humanizers. A button matrix step sequencer that turns the button matrix of the APC40 or Launchpad into a hardware interface for programming MIDI sequences. The official Live API, which lets programmers access some of Live's inner workings, including tracks, clips, notes, names and values, and selection states. The product is available from the Ableton Website and other music retailers for $299. Owners of Max 5 can purchase the Live software for $99. 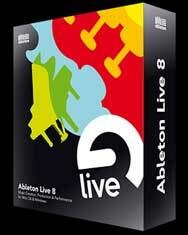 Product bundles of Max for Live plus Ableton Live 8 and Suite 8 are also available. Max for Live runs only with Ableton Live 8. The ideal configuration is an Intel Mac running OS X 10.5 or later.